Glycolic acid is a C2 hydroxy acid that is a widely used chemical compound. It can be polymerised to produce biodegradable polymers with excellent gas barrier properties. Currently, glycolic acid is produced in a chemical process using fossil resources and toxic chemicals. Biotechnological production of glycolic acid using renewable resources is a desirable alternative. The yeasts Saccharomyces cerevisiae and Kluyveromyces lactis are suitable organisms for glycolic acid production since they are acid tolerant and can grow in the presence of up to 50 g l-1 glycolic acid. We engineered S. cerevisiae and K. lactis for glycolic acid production using the reactions of the glyoxylate cycle to produce glyoxylic acid and then reducing it to glycolic acid. The expression of a high affinity glyoxylate reductase alone already led to glycolic acid production. The production was further improved by deleting genes encoding malate synthase and the cytosolic form of isocitrate dehydrogenase. The engineered S. cerevisiae strain produced up to about 1 g l-1 of glycolic acid in a medium containing d-xylose and ethanol. Similar modifications in K. lactis resulted in a much higher glycolic acid titer. In a bioreactor cultivation with d-xylose and ethanol up to 15 g l-1 of glycolic acid was obtained. This is the first demonstration of engineering yeast to produce glycolic acid. Prior to this work glycolic acid production through the glyoxylate cycle has only been reported in bacteria. The benefit of a yeast host is the possibility for glycolic acid production also at low pH, which was demonstrated in flask cultivations. Production of glycolic acid was first shown in S. cerevisiae. To test whether a Crabtree negative yeast would be better suited for glycolic acid production we engineered K. lactis in the same way and demonstrated it to be a better host for glycolic acid production. Glycolic acid is the smallest alpha-hydroxy acid containing both alcohol and carboxyl groups. It is used in a wide range of chemical processes, in cosmetic industry and as a precursor for biopolymers. Glycolic acid can be polymerized to polyglycolic acid (PGA), which has excellent gas-barrier properties and mechanical strength, making PGA an ideal packaging material . Glycolic acid is also used together with lactic acid to produce a co-polymer (PLGA) for medical applications, e.g. in drug delivery . Glycolic acid market in 2011 was USD 93.3 million (40 million kg) and expected to reach USD 203 million in 2018 . Currently, glycolic acid is mainly produced chemically from petrochemical resources in a process where toxic formaldehyde is needed. However, from a sustainable point of view a biotechnological production route would be more desirable. Glycolic acid production from lignocellulosic biomass feedstocks would be more sustainable and possibly also economically feasible. Glycolic acid is naturally produced by a variety of microorganisms from ethylene glycol by oxidation  and from glycolonitrile by hydrolyzation . Chemolithotrophic iron- and sulphur oxidizing bacteria are also known to produce glycolic acid by partially unknown metabolic routes in acidic biomining . Since these pathways are either dependent on the availability of ethylene glycol or glycolonitrile or specific environmental conditions, a pathway allowing flexible use of different or more abundant carbon sources under normal bioprocessing conditions would be desirable. 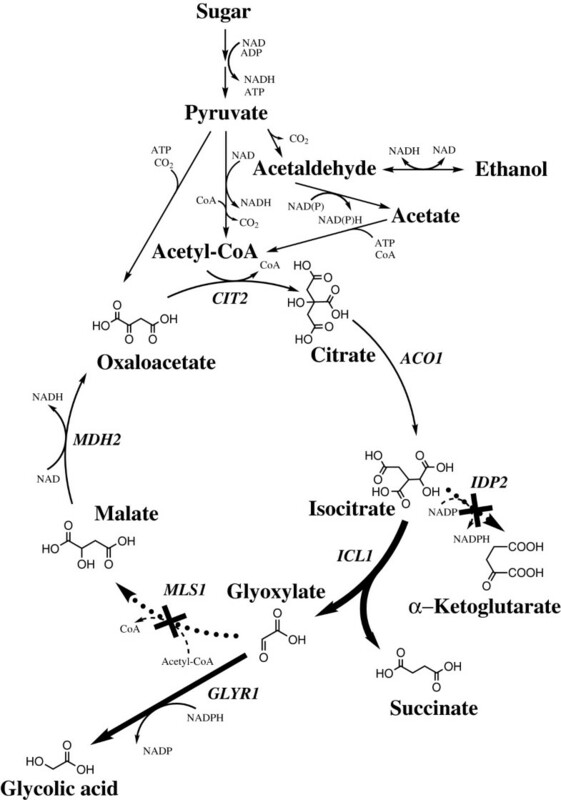 A less explored route is the glyoxylate cycle where C2 compounds such as ethanol are naturally converted into glyoxylate, which can further be converted into glycolic acid by metabolic engineering. Although the main function of the glyoxylate cycle is to ensure the availability of four carbon compounds by utilising two carbon substrates, the naturally existing metabolic routes also allow sugars to be directed to the glyoxylate cycle if the effect of glucose repression of the pathway can be eliminated. The glyoxylate cycle is known to exist in several species within bacteria, fungi and plants. The reactions mostly take place in the cytosol but other cell compartments are also involved . There are a few approaches where the glyoxylate cycle of Escherichia coli has been engineered for glycolic acid production [8–12]. However, no eukaryotic microbe has been used for glycolic acid production to the best of our knowledge. With E. coli, the fermentation conditions are limited due to their need to be maintained close to a neutral pH. The benefit with many fungal species is their tolerance towards low pH conditions, which is advantageous as the decreased need for neutralisation reduces production costs and the production of waste products. Using eukaryotic microorganisms also has other advantages, such as better inhibitor tolerance for biomass hydrolysates. In the present study genetically engineered yeast was used to develop a fermentation-based method for glycolic acid production. The work demonstrates that glycolic acid can be produced from the glyoxylate cycle through the reduction of glyoxylate to glycolic acid using a glyoxylate reductase enzyme. S. cerevisiae has a gene coding for a NADPH specific glyoxylate reductase, GOR1, which is not expressed under normal growth conditions and has a low affinity for glyoxylate . A higher affinity for glyoxylate has been reported for the glyoxylate reductase, GLYR1, from Arabidopsis thaliana that is also NADPH requiring. This enzyme, GLYR1, is not naturally part of the glyoxylate cycle in plants, but is involved in the GABA (γ-aminobutyrate) pathway, which catalyses the detoxification of photorespiratory glyoxylate and succinic semialdehyde . In this communication we describe for the first time yeast strains engineered to produce glycolic acid. Production was demonstrated in S. cerevisiae by the expression of a high affinity glyoxylate reductase in combination with a deletion of the two malate synthase encoding genes to prevent glyoxylate conversion to malate. Production of glycolic acid was further increased by the deletion of the gene encoding the cytosolic form of the isocitrate dehydrogenase and overexpression of the isocitrate lyase encoding gene (Figure 1). The deletion of malate synthase gene and the cytosolic form of isocitrate dehydrogenase gene were also carried out in K. lactis. The modified K. lactis strain produced up to about 15 g l-1 of glycolic acid from ethanol and d-xylose in a bioreactor cultivation. Engineered glyoxylate cycle. Engineering of the glyoxylate cycle for glycolic acid production in Saccharomyces cerevisiae. The genetic modifications done in this work are indicated by bold and dashed arrows. Production and consumption of redox co-factors on the steps from sugar to pyruvate are dependent on the substrate used as a starting material. The toxicity of glycolic acid was tested using Bioscreen cultivations where different concentrations of glycolic acid/glycolate were used. In the first experiment with S. cerevisiae, the pH was not adjusted and growth stopped at about 10 g l-1 glycolic acid (data not shown). We then adjusted the pH to pH 3 or pH 5 at different glycolic acid concentrations (Figure 2). The pKa of glycolic acid is 3.83 meaning that at pH 3 glycolic acid is mainly present in its undissociated form. At pH 3 the growth rate of S. cerevisiae is considerably reduced at glycolic acid concentration of 30 g l-1 and no growth is observed at 50 g l-1. With K. lactis the growth is reduced already at glycolic acid concentration of 15 g l-1. At pH 5, where glycolic acid is mainly present in its dissociated form, growth is still observed at a concentration of 50 g l-1, however at a reduced rate. Toxicity of glycolic acid. 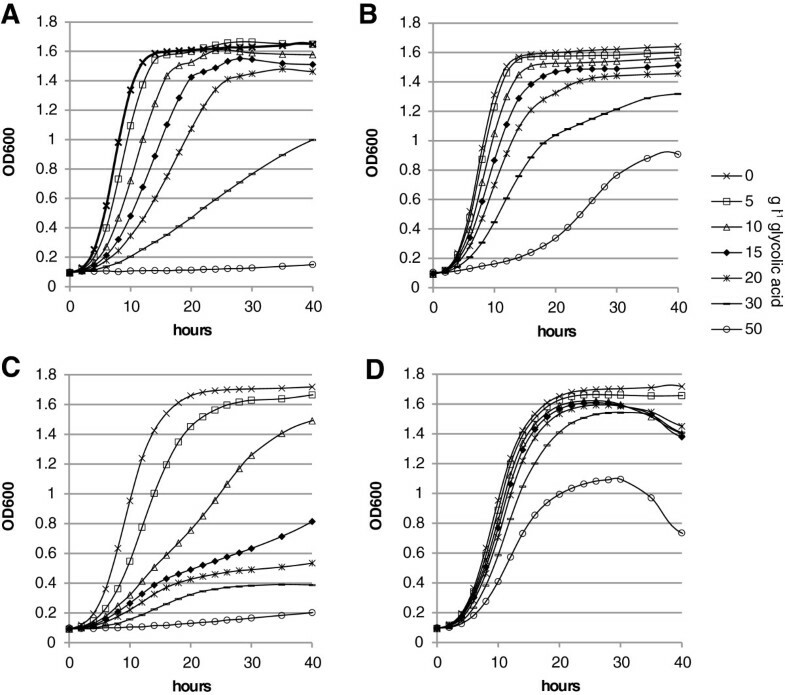 The Bioscreen toxicity assay growth curves of the Saccharomyces cerevisiae CEN.PK2-1D strain A) at pH 3, and B) at pH 5 and Kluyveromyces lactis KHO69-8C strain C) at pH 3, and D) at pH 5. Yeast was grown on SCD medium with different glycolic acid concentrations. The activity of the endogenous S. cerevisiae glyoxylate reductase GOR1 and the A. thaliana GLYR1 he GLYR1 gene was codon optimised for expression in yeast. Both genes were overexpressed in S. cerevisiae from the same multicopy plasmid and the activity with glyoxylic acid and NADPH was measured from crude extracts. For glyoxylic acid, the Km was 1.9 mM and the Vmax 1.8 U (mg total protein)-1 for the endogenous Gor1p, and for the A. thaliana GLYR1 the Km was 38.8 μM and the Vmax 6.5 U (mg total protein)-1. Glycolic acid production was tested in S. cerevisiae strains where either the GOR1 or GLYR1 was overexpressed. No glycolic acid production was detected in a strain where the endogenous glyoxylate reductase, GOR1, was expressed. Since GLYR1 was found to have a much higher reaction rate and affinity than that of Gor1p and based on the fact that no glycolic acid was produced by overexpressing GOR1, we decided to exclusively use GLYR1 in further strain constructions as illustrated in Figure 1. As a parent strain we used H3675, a modified CEN.PK113-1A strain, which contains a eukaryotic d-xylose utilisation pathway including overexpressed endogenous S. cerevisiae xylulokinase encoding gene and genes for d-xylose reductase and xylitol dehydrogenase from Scheffersomyces (Pichia) stipitis[16, 17]. To prevent glyoxylic acid from reacting with acetyl-CoA to form malate, the malate synthase gene MLS1 was deleted. DAL7, a homologue of MLS1, was also deleted to ensure that there was no malate synthase activity. To confirm this, malate synthase activity was measured from crude cell extracts from cells grown on glycerol-ethanol mixture. In the absence of malate synthase activity, growth on ethanol is not possible and because of this the growth media contained also glycerol. In the parent strain, malate synthase activity was 0.19 U mg-1 and in the strains with one (H3675 mls1-Δ1) or two (H3675 mls1-Δ1, dal7-Δ1) malate synthase genes deleted the malate synthase activity was not detectable. To increase glycolic acid production, the isocitrate lyase encoding gene ICL1 was overexpressed and the cytosolic form of the isocitrate dehydrogenase encoding gene IDP2 was deleted. Since the glyoxylate cycle is glucose repressed in S. cerevisiae, we also deleted the gene for the regulatory factor mediating glucose repression, REG1. The resulting strains were cultivated in shake flasks in non-buffered synthetic complete media containing either d-glucose (20 g l-1), d-xylose (20 g l-1) and ethanol (20 g l-1), or only ethanol (20 g l-1) as a carbon source. Samples from the cultures were analysed for glycolic acid production using HPLC (Figure 3). Final titers of glycolic acid and biomasses are presented in Table 1. Glycolic acid production in flask cultivations. Engineered H3675 based Saccharomyces cerevisiae strains were tested for glycolic acid production on different carbon sources in shake flask cultivations on SC media: A) d-glucose (20 g l-1), B) d-xylose (20 g l-1) + EtOH (20 g l-1), C) EtOH. There was no glycolic acid production detected in the parent strain H3675. During the cultivation the pH dropped from pH 5.5 to pH 2.9-3.2. Error bars represent ± the standard error of the mean (SEM; n = 3) and when not visible are smaller than the symbol. Final titers and final biomasses of different glycolic acid producing S. cerevisiae strains grown in SC media containing either d-glucose (20 g l-1), d-xylose (20 g l-1) and ethanol (20 g l-1), or only ethanol (20 g l-1) as carbon sources. The d-xylose utilising Saccharomyces cerevisiae strain H3675 (MATα his3 leu2 trp1 ura3::XYL1-XYL2 xks1::XKS1 MAL2-8c SUC2), a modified [CEN.PK113-1A ], was used as a parent strain for all S. cerevisiae glycolic acid production strains. ± presents the standard error of the mean (SEM; n = 3). The expression of the high affinity glyoxylate reductase GLYR1 already resulted in glyoxylate production (Figure 3). Since the glyoxylate cycle is repressed by glucose, we assume that the glucose is first fermented to ethanol, which is subsequently converted to glycolic acid (Figure 3A). To avoid glucose repression, we cultivated the cells in a medium with d-xylose and ethanol (Figure 3B) or only ethanol as carbon sources (Figure 3C). In the medium with only ethanol, cells lacking malate synthase activity were not able to grow. For this reason, cells for all experiments were first pre-grown on d-glucose containing medium, then washed and inoculated at an optical density (OD600) of 2 for subsequent flask cultivations for assessment of glycolic acid production. We also tested if more glycolic acid production could be attained by limiting glucose repression by deleting REG1. 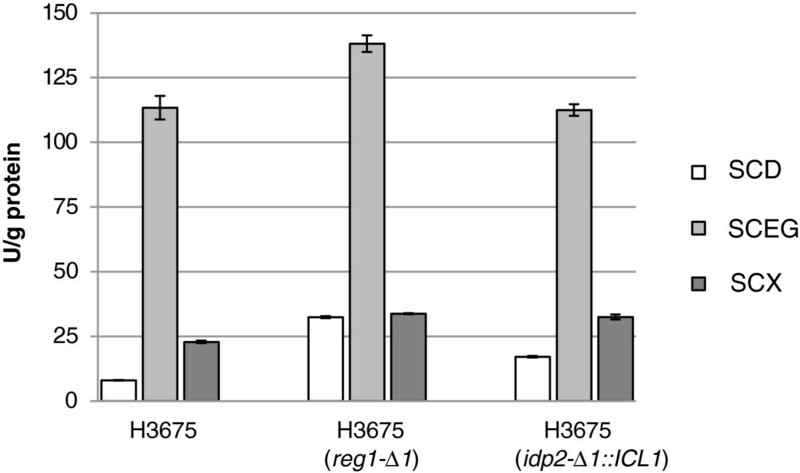 As seen from Figure 3, the REG1 deletion did not result in increased glycolic acid production in a S. cerevisiae glycolic acid production strain H3994 (pGLYR1, mls1-Δ1, dal7-Δ1, idp2-Δ1::ICL1, reg1-Δ1) compared to the similar strain H3846 without REG1 deletion. We then tested the isocitrate lyase activity in crude cell extracts since the ICL1 gene is controlled through glucose repression. The parent strain H3675 showed very low isocitrate lyase activity when grown on d-glucose. The reg1 null mutant showed increased activity on d-glucose (Figure 4) with activity levels being even higher in the reg1 null mutant strain than when the isocitrate lyase encoding gene was overexpressed. However, independent of the genetic background the highest isocitrate lyase activity was observed when the cells were grown on a mixture of ethanol and glycerol (Figure 4). Effect of REG1 deletion on isocitrate lyase activity in presence of different carbon sources. Isocitrate lyase enzyme activities in the Saccharomyces cerevisiae strain when REG1 is deleted compared to the CEN.PK113-1A based H3675 strain without deletion and to a strain where isocitrate dehydrogenase is deleted and replaced by isocitrate lyase overexpression. SCD = synthetic complete medium with 20 g l-1d-glucose, SCEG = synthetic complete medium with 20 g l-1 ethanol and 20 g l-1 glycerol, SCX = synthetic complete medium with 20 g l-1d-xylose. Error bars represent ± the standard error of the mean (SEM; n = 3) and where not visible are smaller than the symbol. 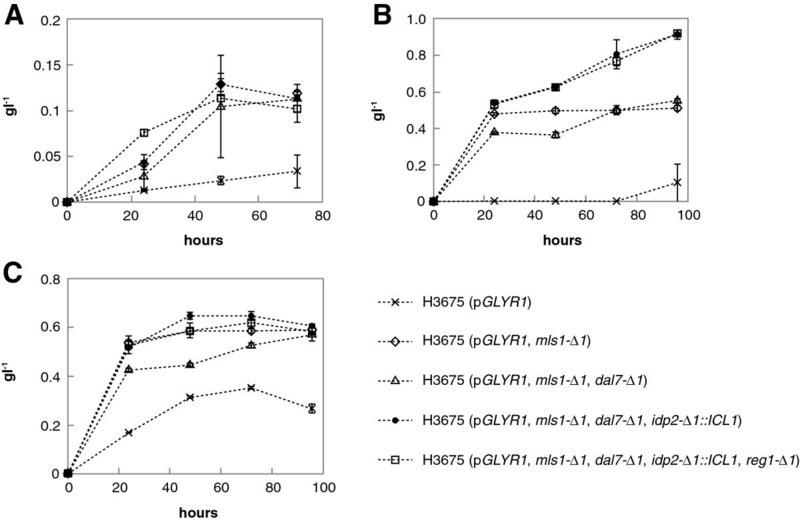 The high affinity glyoxylate reductase gene GLYR1 was expressed in K. lactis strain containing malate synthase and isocitrate dehydrogenase deletions. These modifications had been analysed to be beneficial for glycolic acid production in S. cerevisiae so we assumed that they would increase glycolic acid production also in K. lactis. The unmodified K. lactis parent strain KHO69-8C did not produce detectable amounts of glycolic acid on d-glucose, d-xylose and ethanol, or only ethanol as a carbon source (data not shown). Similarly to the engineered S. cerevisiae strains the glycolic acid production was found out to be the highest when the cells were grown on a mixture of d-xylose and ethanol. 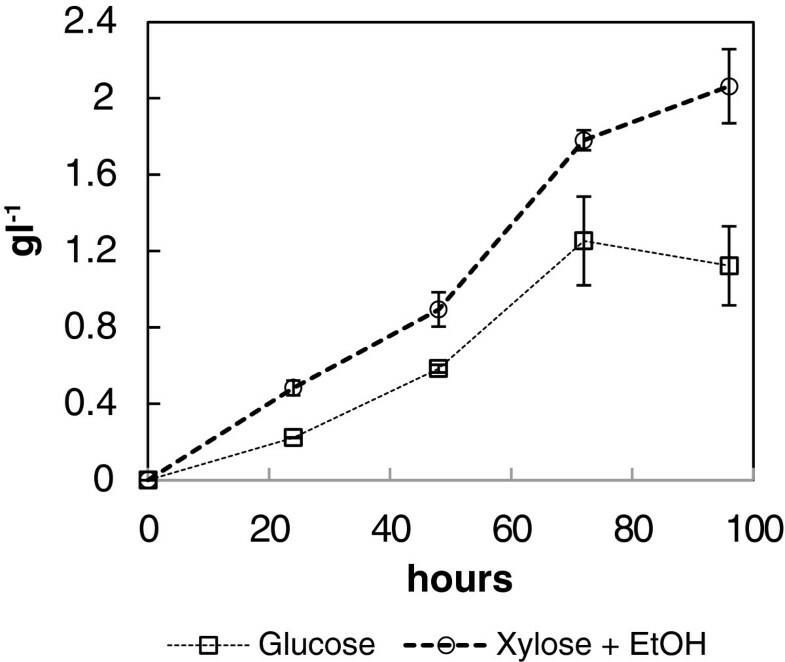 The results of the engineered K. lactis glycolic acid production strain grown on a mixture of 20 g l-1d-xylose and 20 g l-1 ethanol (Figure 5) showed that K. lactis is a better glycolic acid producer than S. cerevisiae. Kluyveromyces lactis glycolic acid production in flask cultivations. Glycolic acid production of K. lactis strain H3986 grown in SC media with 20 g l-1d-glucose or 20 g l-1d-xylose + 20 g l-1 EtOH. Error bars represent ± the standard error of the mean (SEM; n = 3) and when not visible are smaller than the symbol. In order to obtain higher glycolic acid concentrations we cultivated the K. lactis strain H3986 also in an aerobic fed-batch bioreactor cultivation at pH 5. We monitored the concentrations of ethanol and d-xylose in the cultivation with on-line HPLC and adjusted their feed automatically after the batch phase in order to try to maintain their concentrations at reasonable levels; with setpoint value for d-xylose above 5 g l-1 and ethanol between 1 and 5 g l-1. 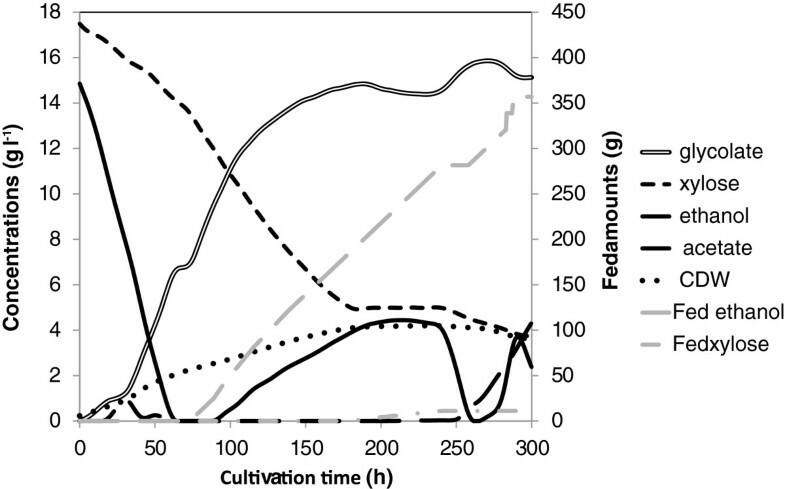 Figure 6 shows the concentrations and Figure 7 shows the specific accumulation rates of the main substrates and products during the cultivation. During the batch phase 6.7 g l-1 glycolate was produced in 75 hours. After additional 115 hours with ethanol feed the glycolate concentration increased to 14.8 g l-1. The specific accumulation rate of glycolate was the highest in the batch phase between 35 and 60 hours when it stayed above 0.1 g h-1 g-1 CDW (cell dry weight). During this time the ethanol concentration decreased from 6.7 to 0.4 g l-1 and d-xylose concentration decreased from 15.7 to 14.3 g l-1. The specific accumulation rate of glycolate was above 0.07 g h-1 g-1 CDW between 76 and 96 hours while ethanol concentration was below 0.4 g l-1 and d-xylose concentration above 11 g l-1 and ethanol was fed. Table 2 presents the yields of the K. lactis bioreactor cultivation from the beginning of the cultivation to two time points; 95.5 and 167.5 hours. Yields for glycolate and the main side product glyoxylate are calculated based on ethanol consumption and based on a sum of consumption of d-xylose and ethanol. Yields of malate, acetate, cell dry weight and CO2 are calculated only based on a sum of ethanol and d-xylose consumption. In all cases the yields were lower at the later time point, which is most likely due to the ethanol evaporation, which has not been taken into account in the calculations. At 95.5 hours the glycolate yield (g g-1) from ethanol was above 50%, but also glyoxylate yield was close to 30%. At 167.5 hours the ratio of glycolate vs. glyoxylate improved as 4 times more glyoxylate was produced than glycolate. Minor amounts of malate and acetate were also formed. The volumetric productivity of glycolate at the time points 95.5 and 167.5 hours was 0.11 and 0.09 g l-1 h-1, respectively. The theoretical maximum yields for glycolic acid production were calculated to be from ethanol 1.00 C-mol / C-mol (1.65 g g-1), from d-glucose 0.67 C-mol / C-mol (0.85 g g-1), and from d-xylose 0.67 C-mol / C-mol (0.85 g g-1). The glycolate yield achieved from ethanol at 95.5 hours, 0.52 g g-1, is about 32% of the theoretical maximum yield. Kluyveromyces lactis glycolic acid production in fed-batch bioreactor. Concentrations (g l-1) of glycolate, d-xylose, ethanol, acetate, and cell dry weight (CDW) in fed-batch bioreactor cultivation of K. lactis glycolate strain on mixture of d-xylose and ethanol under aerobic conditions at pH 5. Fed amounts (g) of ethanol and d-xylose are also presented. Measurements were performed with on-line HPLC at 0.5-hour intervals and data was smoothed as described in materials and methods. Specific accumulation rates in fed-batch bioreactor cultivation of Kluyveromyces lactis. Specific accumulation rates (g h-1 g-1CDW) of glycolate, d-xylose, ethanol, acetate and cell dry weight (CDW) in fed-batch bioreactor cultivation of K. lactis glycolate strain on mixture of d-xylose and ethanol under aerobic conditions at pH 5. Measurements were performed with on-line HPLC at 0.5-hour intervals and data was smoothed as described in materials and methods. Yields of glycolate and the main side products from ethanol and d-xylose from the start until two time-points of K. lactis bioreactor fed-batch cultivation. There are a few patent applications describing glycolic acid production in E. coli through the glyoxylate cycle [8–11]. In these approaches glycolic acid production was achieved by overexpressing the endogenous glyoxylate reductases ycdW and yiaE while attenuating the malate synthase genes aceB and glcB. Additional modifications were also done such as isocitrate lyase aceA overexpression. A very similar approach was recently described by Martin et al. where glycolic acid was used as a precursor for the production of 3,4-dihydroxybutyrate and 3-hydroxy-γ-butyrolactone in E. coli, with 1.4 g l-1 glycolate production level from 10 g l-1d-glucose. In addition, isocitrate lyase and malate synthase encoding genes have been introduced into Bacillus subtilis, a species naturally lacking the glyoxylate cycle . This resulted in glycolic acid production although the levels were very low as most of the glyoxylate was presumably converted to malate. To the best of our knowledge, glycolic acid production has not been attempted in eukaryotic microbes. When using E. coli as a production host the fermentation conditions are restricted to neutral pH, while yeast species such as S. cerevisiae and K. lactis can tolerate acidic pH. This is advantageous since the contamination risk is reduced and the low pH also reduces the need for neutralization. In an industrial process the use of less base would result in less undesired salt formation. Production at acidic pH has been shown to be advantageous for lactic acid [20–22] which is a similar compound to glycolic acid. Lactic acid is a C3 mono-hydroxy acid which has a hydroxyl group adjacent to the carboxyl group like glycolic acid. Glycolic acid is not very toxic for S. cerevisiae or K. lactis even at acidic pH. K. lactis is more sensitive at pH 3 but less sensitive at pH 5. Both yeast species are able to grow at glycolic acid concentrations up to 30–50 g l-1, and thus may be able to produce glycolic acid at high titers. Essential for the production of glycolic acid from glyoxylic acid is the presence of an active glyoxylate reductase. Glyoxylate reductases can be NADPH dependent (EC 1.1.1.79) or NADH dependent (EC 1.1.1.26). Glyoxylate reductases are found from prokaryotes to mammals but only a few enzymes and the corresponding genes have been characterized. The metabolic role of this enzyme is not unambiguously clear as different functions have been described in different organisms. In S. cerevisiae, two glyoxylate reductase isoforms have been purified [23, 24] but only one gene, GOR1, encoding glyoxylate reductase activity has been identified . Deletion of the glyoxylate reductase, GOR1, led to increased biomass formation after diauxic shift, which was thought to be caused by increased NADPH availability . The biological function of the enzyme is not clear but it may have a role in glyoxylate detoxification as has been described for plants . In plant photorespiration, glyoxylate reductase removes the toxic GABA (γ-aminobutyrate) pathway intermediates glyoxylate and succinic semialdehyde, which can accumulate in plants during stress . In A. thaliana, two glyoxylate reductases, GLYR1  and GLYR2  have been characterized. Recent findings have shown that although AtGLYR1 has a peroxisomal targeting signal (PTS1), the protein is exclusively cytosolic suggesting that this particular PTS1 C-terminal tripeptide -SRE is nonfunctonal in plants . The other plant glyoxylate reductase, GLYR2, is found in plastids [14, 25]. Km of purified GLYR1 was 4.5 μM for glyoxylate and kcat 13.02 s-1. In the present study GLYR1 was expressed in S. cerevisiae the Km of the cell extract being slightly higher, 38.8 μM. The difference in the Km is probably caused by different assay conditions as the buffer and the pH of the reaction mixture were different in these two studies. In E. coli, two genes, ycdW and yiaE, code for glyoxylate reductase enzymes with the Km being 0.6 mM and 6.6 mM and the kcat being 70.6 s-1 and 203 s-1 respectively, for the purified proteins . The proteins complement each other but YcdW displays higher affinity for the reduction of glyoxylate whereas YiaE shows higher affinity for the reduction of hydroxypyruvate . These two enzymes have successfully been used for glycolic acid production in E. coli[8–12]. We compared the affinities of them and the other glyoxylate reductases, where the encoding gene is known and which are described in the literature [23–25, 27–32]. We chose the A. thaliana GLYR1 because it had the highest affinity for glyoxylate. In this work, we showed that overexpression of a glyoxylate reductase gene with low affinity for glyoxylic acid, such as the S. cerevisiae Gor1p, did not result in glycolic acid production. However, when expressing a high affinity enzyme such as the GLYR1 from A. thaliana, glycolic acid production was observed. The higher affinity of the glyoxylate reductase seems to be crucial for glycolic acid production, at least when no other genetic modifications are made to the host. The main function of the glyoxylate cycle is to ensure the availability of four carbon compounds during utilisation of two carbon substances as a sole carbon source. The glyoxylate cycle has a similar function when fatty acids are used as a carbon source as beta-oxidation yields two-carbon acetyl-CoA. As a net reaction, the acetyls of two acetyl-CoA molecules are converted to one four carbon compound in the glyoxylate cycle. The C4 intermediate molecule can compensate for the carbon loss of the TCA-cycle. Several of the enzymes involved in the glyoxylate cycle are isozymes of the enzymes in the TCA cycle. Only isocitrate lyase and malate synthase are found solely in the glyoxylate cycle. Malate synthase, Mls1p, is the main enzyme utilising glyoxylic acid as a substrate in yeast, and its deletion probably resulted in glyoxylic acid accumulation and consequently in improved glycolic acid production. When using ethanol or a d-xylose-ethanol mixture as a carbon source, we observed an increased glycolic acid production rate. However, the lack of functional glyoxylate cycle, e.g. deletion of the malate synthase encoding gene, has the consequence that the cells are no longer able to use C2 carbon sources such as ethanol or acetate for growth. Thus, the dry mass of the cells grown only on ethanol remained constant during the fermentation. To prevent starvation of the cells and to reduce glucose repression, we used d-xylose and ethanol as carbon sources. By using a mixture of these two carbon sources we obtained the highest glycolic acid titers. In a further attempt to increase the glycolic acid production, we deleted the gene encoding the cytosolic form of the isocitrate dehydrogenase, IDP2, while simultaneously overexpressing the isocitrate lyase, ICL1, gene. These modifications indeed increased the glycolic acid production but as the modifications were combined it is impossible to further analyse how much of the increase was impact of IDP2 deletion and which part was influence of ICL1 overexpression. The overexpression of the ICL1 using a constitutive promoter resulted in increased isocitrate lyase activity on d-glucose and d-xylose media. However, this activity was much lower than the activity achieved during growth on mixture of ethanol and d-glycerol. This observation - in addition to the role of glucose repression [18, 33] - is possibly explained by glucose-induced post-translational modifications such as phosphorylation [34, 35] or proteolytic inactivation , which have been shown to regulate Icl1p activity. The glyoxylate cycle enzymes are highly glucose repressed in S. cerevisiae. The isocitrate lyase (ICL1) , aconitase (ACO1) , citrate synthase (CIT2) , malate synthase (MLS1)  and malate dehydrogenase (MDH2)  enzymes are sensitive to carbon catabolite repression. In K. lactis the enzymes of the cycle have not been studied to the same extent but at least isocitrate lyase is similarly glucose repressed as its homolog in S. cerevisiae and the deletion of the encoding gene causes the strain to be unable to grow on ethanol media . However, unlike S. cerevisiae isocitrate lyase K. lactis Icl1p is not subject to carbon catabolite inactivation but the enzyme is regulated only at transcriptional level by glucose repression . Thus, the Icl1p activity responds more rapidly to the addition of fermentable sugars in S. cerevisiae than in K. lactis. As many of the enzymes have isozymes participating in different metabolic pathways these parallel enzymes can partially compensate for the defect; however the differences in expression and localization result in only partial compensation in S. cerevisiae. Excluding the isocitrate lyase, the other glyoxylate cycle enzymes are known to have isozymes in S. cerevisiae. An example are the citrate synthases CIT1 (TCA-cycle) and CIT2 (glyoxylate cycle); both need to be disrupted in order to produce citrate synthase deficient strains, which do not grow on non-fermentative carbon sources . There are also two different genes coding for malate synthase: MLS1 that functions in the glyoxylate cycle and DAL7 that is part of allantoin catabolism . Both of these genes were deleted in our S. cerevisiae production strains but no further increase of glycolic acid production was detected after DAL7 deletion, leading to the conclusion that the isozyme was not competing with the glyoxylate cycle on the use of cytosolic glyoxylate. At the transcriptional level, one of the most central regulators of the glyoxylate cycle is the serine/threonine kinase encoded by SNF1, which is highly conserved among eukaryotes . Both S. cerevisiae and K. lactis require the Snf1p kinase together with the Cat8p transcriptional activator for the utilisation of nonfermentable carbon sources . In S. cerevisiae, Snf1p forms a protein complex with the activator subunit Snf4p and other proteins like Sip1p, Sip2p and Gal83p . The activity of Snf1p is dramatically increased during glucose starvation and it is repressed on glucose medium. However, in K. lactis the Cat8p transcription is not similarly carbon source regulated, which indicates that posttranscriptional regulation of Cat8p has a prominent role in K. lactis. Furthermore, the active form of Snf1p regulates the expression levels of several genes encoding key enzymes in carbon metabolism. The protein phosphatase complex Reg1Glc7 of S. cerevisiae seems to be a negative regulator of Snf1p while Reg1p functions as a targeting subunit of the phosphatase . In fact, glucose repression does not function anymore in the reg1 null mutant strain . Nonetheless, the exact mechanism behind glucose repression is still unknown . As shown in this article, deletion of the S. cerevisiae REG1 gene had a beneficial effect on isocitrate lyase activity in d-glucose and d-xylose grown cells. However, the Icl1p activity of cells grown on ethanol-glycerol mixture was markedly higher. This suggests that the activity is not only repressed through the Reg1p but also other regulatory mechanisms are involved. This is also supported by the observation that glycolic acid production was not increased by the reg1 mutation. Unlike bacteria, eukaryotic microorganisms are compartmentalized and the reactions of the glyoxylate cycle take place in different cellular compartments, the cytosol, the peroxisomes and the mitochondria. The latter one is involved through the TCA cycle, which is closely associated with the glyoxylate cycle through many shared metabolites. Differences occur between eukaryotic organisms related to the localisation of the enzymes in cytosol and peroxisomes . Current knowledge suggests that the S. cerevisiae isocitrate lyase (Icl1p), aconitase (Aco1p) and malate dehydrogenase (Mdh2p) are located in the cytosol and citrate synthase (Cit2p) and malate synthase (Mls1p) are peroxisomal enzymes. However, despite the presence of a peroxisomal targeting signal on Mls1p, it can be localised to the cytosol during growth on ethanol or acetate medium . The reason for these two different localizations is probably due to the availability of acetyl-CoA. During ethanol or acetate catabolism, acetyl-CoA is produced in the cytoplasm while the beta-oxidation is carried out inside the peroxisomes . Like Mls1p, Cit2p also has a peroxisomal targeting signal (SKL) but in contrast to the mixed localization of Mls1p, Cit2p is found only in peroxisomes. This fact suggests that peroxisomal Cit2p is not capable of utilising cytosolic acetyl-CoA in the glyoxylate cycle. In fact, the cit2 null mutant strain does not display any particular phenotype whereas the cit1 null mutant strain cannot grow on acetate medium . This observation indicates that when cytosolic acetyl-CoA from ethanol or acetate catabolism is utilised in the glyoxylate cycle, the citrate synthase activity might come from the mitochondrial Cit1p. Of the enzymes directly involved in glycolic acid production, citrate synthase is the only one located outside the cytosol. Thus, transport is required between the different cell compartments making the yeast production route more complicated compared to the bacterial glyoxylate cycle. In this communication we describe for the first time a yeast strain that was engineered to produce glycolic acid through the glyoxylate cycle. In the present work, up to 15 g l-1 of glycolic acid was produced by the engineered yeast. In flask cultivations the production was shown to be possible also at a pH where the acid is in its undissociated form. For the economical production of glycolic acid, the titer still has to be improved. However, this is a successful first demonstration of glycolic acid production at low pH. The S. cerevisiae strain H3675 (MATα his3 leu2 trp1 ura3::XYL1-XYL2 xks1::XKS1 MAL2-8c SUC2), which is a d-xylose utilising modification of VTT C-10880, [CEN.PK113-1A, kindly provided by Dr. P. Kötter (Institut für Mikrobiologie, J.W. Goethe Universität Frankfurt, Germany) , was used as a parent strain for all further S. cerevisiae modifications. The strain has been modified to utilise d-xylose by introducing XYL1 (d-xylose reductase) and XYL2 (xylitol dehydrogenase) genes and by overexpression of the endogenous XKS1 (xylulokinase) gene [16, 17]. The K. lactis strain H3954 [KHO69-8C (MATα ura3 leu2 his3::loxP ku80::loxP)]  was used as a parent strain for all further K. lactis modifications. All strains constructed in this work are listed in Table 3. The xylose utilising Saccharomyces cerevisiae strain H3675 (MATα his3 leu2 trp1 ura3::XYL1-XYL2 xks1::XKS1 MAL2-8c SUC2), a modified VTT C-10880, [CEN.PK113-1A ], was used as a parent strain for all S. cerevisiae glycolic acid production strains. The Kluyveromyces lactis strain H3954 [KHO69-8C (MATα ura3 leu2 his3::loxP ku80::loxP)]  was used as a parent strain for all K. lactis glycolic acid production strains. The glyoxylate reductase gene of A. thaliana, GLYR1, was codon optimised for S. cerevisiae by GenScript (GenScript, USA). For heterologous expression in S. cerevisiae, the plasmid was digested with Eco RI and Bam HI (both NEB) and the GLYR1 gene was ligated between the Eco RI and Bam HI sites of p2159, which was derived from the pYX212 plasmid (R&D Systems) as described in Verho et al. . This plasmid has a constitutive TPI1 promoter and URA3 for selection. The yeast strain H3675 was transformed with the plasmid and the transformants were selected for URA prototrophy. All yeast transformations were done using the lithium acetate method . The pUG6 plasmid  with a KanMX marker gene and loxP sites was used as a template for malate synthase, MLS1, deletion. The deletion cassette was prepared by PCR using primers O8635 and O8636 (all oligo sequences are listed in Table 4) which both consisted of about 40 bp of flanking region for homologous recombination upstream and downsteam of the S. cerevisiae MLS1 gene. For DAL7 deletion, a similar plasmid p1431 with a BLE marker gene  was used. Primers O3637 and O3638 both consisted of about 40 bp of flanking region for homologous recombination upstream and downsteam of the S. cerevisiae DAL7 gene. Transformants were placed on YPD plates supplemented with 200 μg ml-1 of G418 (Invitrogen, USA) or 100 μg ml-1 of Zeocin (Invitrogen, USA) for selection. Deletions were checked by yeast colony-PCR with primers O8639, O8640 (MLS1) and O8641, O8642 (DAL7). The REG1 deletion was carried out in a similar manner as the MLS1 deletion but with the primer pair O8661 and O8662. All deletion cassettes were prepared using the Phusion polymerase (Thermo Scientific). Sequences in underlined italics show the flanking sequence needed for homologous recombination in the yeast transformation. Yeast DNA for yeast colony PCR was extracted by incubating a single colony in 50 μl of 1 mg ml-1 Zymolyase 100 T (Seikagaku Biobusiness, Japan) in 1 M sorbitol for 10 minutes at room temperature. After incubation the extract was centrifuged for 15 seconds at 2000 g. The supernatant was discarded and the remaining pellet was heated at +95°C for 5 minutes. The dry pellet was resuspended into 30 μl water and 10 μl of it was used as a template in PCR. All colony PCR reactions were carried out with the DyNAzyme II polymerase (Thermo Scientific). To catalyse the cleavage of the loxP-sites, the Cre recombinase was expressed in S. cerevisiae by transforming the Cre expression plasmid pSH47 including the URA3 selection gene  into the yeast. The Cre recombinase gene is under control of the galactose inducible promoter, which was activated by growing the transformants for one to two days in liquid media containing 20 g l-1 galactose as a carbon source. After the ability to grow on the named antibiotic selection was lost, the pSH47 plasmid and ability to grow on uracil deficient media was lost by growing the strain in rich liquid media (YPD). The expression of isocitrate lyase, ICL1, and deletion of isocitrate dehydrogenase, IDP2, were carried out by a single integration cassette. The cassette was prepared by homologous recombination in yeast as described by Colot et al. . The ICL1 gene was first amplified by PCR using genomic DNA from the H3675 strain as a template. The primers O8649 and O8650 used for the amplification included flanks for homologous recombination with plasmid p2159. The S. cerevisiae FY834  strain was transformed with the resulting ICL1 fragment together with the Eco RI and Bam HI (both NEB) digested p2159 plasmid for homologous recombination. The transformed yeast cells were cultured on synthetic complete media (SC) (modified from Sherman, 1983)  with 20 g l-1d-glucose (SCD) plates lacking uracil. Recombined plasmids were extracted from yeast and amplified in E. coli. In order to find the correct plasmid constructs, colony PCR was carried out with the primers O8651 and O8652. The ICL1 overexpression fragment was then amplified from the correct p2159-ICL1 plasmid by PCR with primers O8653 and O8654. The primer pair included about 40 bp flanking region for homologous recombination with the loxP-KanMX-loxP fragment and pRS426 shuttle vector . The loxP-KanMX-loxP fragment was amplified by PCR with primers O8655 and O8656 using the pUG6 plasmid  as a template. The primer pair has flanking regions for homologous recombination with the previously constructed ICL1 overexpression fragment and with the pRS426 shuttle vector. For constructing the idp2Δ::ICL1 cassette, the S. cerevisiae CEN.PK2-1D strain (MATα ura3-52 leu2-3,112 trp1-289 his3Δ MAL2-8 c SUC2)  was transformed with the Eco RI and Xho I (both NEB) digested pRS426 plasmid, ICL1 overexpression fragment and loxP-KanMX-loxP fragment. The plasmid that was derived through homologous recombination was rescued from yeast and amplified in E. coli. The correct plasmid composition was confirmed by colony PCR and sequenced with primers O8657 and O8658. The idp2Δ::ICL1 cassette was amplified from the correct plasmid with primers O8659 and O8660 including the flanking regions for homologous recombination into the IDP2-locus of S. cerevisiae. The fragment was transformed to the H3790 strain where the MLS1 and DAL7 genes had been deleted as previously described. G418 antibiotics were used for selection and an enzyme assay was used to check the functionality of isocitrate lyase overexpression. The looping out of the KanMX marker was done with Cre recombinase as described above. The expression vector for K. lactis, pJJH958r  was used as a backbone for GLYR1 glyoxylate reductase gene overexpression. The S. cerevisiae codon optimised A. thaliana GLYR1 gene was also used for K. lactis constructs. The pJJH958r plasmid was digested with Kpn I to remove the CreR gene with GAL1 promoter and CYC1 terminator and the vector was then religated. The resulted circular vector, p4150, was digested with Sal I. The GLYR1 gene with the TPI1 promoter and a terminator was amplified by PCR using primers O8643 and O8644 to introduce Sal I restriction sites. The PCR fragment was digested with Sal I and ligated to the Sal I site of the p4150 vector. The resulting multicopy vector expressing GLYR1 gene, p4185, has the URA3 gene as a selection marker. The K. lactis gene [Gene ID: 2895299] was identified as the gene with the highest homology to the S. cerevisiae MLS1 and was deleted following a protocol described previously . The HIS3 gene of the plasmid pJJH955H  was amplified by PCR using primers O8768 and O8769 that had 50 bp flanking regions upstream and downstream the open reading frame of the MLS1 homologue. The PCR product was then transformed to the K. lactis strain H3954 and transformants selected for the ability to grow in the absence of histidine. The deletion cassette was looped out as described previously . The success of the deletion was confirmed by testing the growth on ethanol media. The K. lactis gene with the [Gene ID:2894935] was identified as the closest homologue to the S. cerevisiae IDP2 gene. It was deleted in the H3968 in a similar way as the MLS1 homologue described above using the primers O8772 and O8773. Deletions were checked by yeast colony-PCR. The resulting strain H3976 was transformed with the GLYR1 expression vector, p4185, resulting in the strain H3986. The strain was tested for glycolic acid production. To test the toxicity of glycolic acid to yeast cells, the growth of the S. cerevisiae CEN.PK2-1D (MATα ura3-52 leu2-3,112 trp1-289 his3Δ MAL2-8 c SUC2)  and K. lactis KHO69-8C strains were monitored in a computer-controlled Bioscreen C MBR incubator (Oy Growth Curves Ab Ltd, Finland) in different glycolic acid concentrations varying between 0 – 50 g l-1. Cells were precultured overnight on SCD and diluted to the final OD600 of 0.5 with water. 30 μl of the cell suspension was added into each well of the Bioscreen plate containing SCD medium and the desired amount of glycolic acid (Sigma-Aldrich, Germany). Total volume of each well was 300 μl. The pH was either not adjusted or it was adjusted with NaOH to pH 3 or to pH 5. Plates were incubated in the Bioscreen at 30°C for 40 hours and the OD600 was measured at 30-minute intervals. For the protein extractions, S. cerevisiae strains were cultured overnight on YPD (20 g l-1 Bacto-peptone (BD, USA), 10 g l-1 Bacto-yeast extract (BD, USA), 20 g l-1d-glucose). Washed cells from each culture were resuspended into 5 ml of 10 mM sodium phosphate buffer with EDTA free protease inhibitor (Roche, USA). The cells were disrupted three times for 30 sec in a Fast Prep (Bio 101). The cell extracts were centrifuged (15 min, 25000 g, 4°C) and the supernatants were used in the assay. The following reaction mixture was used for assaying the glyoxylate reductase activity in strains expressing GLYR1: 50 mM sodium phosphate buffer, pH 7, 200 μM NADPH and glyoxylic acid (Sigma-Aldrich, Germany) where pH was adjusted to ~7.0 with NaOH in concentrations ranging from 2 μM to 90 mM. The consumption of NADPH in the reactions was monitored by measuring absorbance at 340 nm. The reaction was assayed at 25 seconds intervals for 300 seconds after addition of glyoxylic acid. The enzyme assays were performed at 30°C in an Arena 20XT (Thermo, Vantaa, Finland) automated analyser. A Michaelis-Menten-term was fit to the data and the Km values of GLYR1 and Gor1p for glyoxylate were calculated using the GraphPad Prism 5.03 software. Protein concentrations were determined using the Protein Assay Kit (BioRad Laboratories, Hercules, CA, USA). For the malate synthase (Mls1p and Dal7p) assay, the S. cerevisiae strains were precultured overnight on YPD medium and then shifted into SC medium with d-glucose (D) or ethanol and glycerol (EG) as a carbon source. The concentration of each carbon source in the media was 20 g l-1. The initial OD600 value of each SCD culture was 0.5 while the corresponding value for the SCEG cultures was 1.0. After 7 hours, the cells were lysed as described above except that the sodium phosphate buffer was now replaced by 50 mM potassium phosphate buffer pH 7.0. The reaction mixture in the malate synthase assay was: 100 mM Tris pH 8.0, 5 mM MgCl2, 100 μM acetyl-CoA, 10 μl cell extract and water to 980 μl. After the stabilization, 20 μl glyoxylate was added into the final concentration of 2 mM and the decreasing absorbance of acetyl-CoA at 232 nm was monitored for 6 minutes. The UltrospecTM 2100 pro spectrophotometer (GE Healthcare Life Sciences, USA) and UV quartz cuvettes were used for the malate synthase assay. For the isocitrate lyase (Icl1p) assay, S. cerevisiae strains were precultured overnight on YPD medium and then shifted to SC medium with d-glucose (D), d-xylose (X) or ethanol and glycerol (EG) as a carbon source as described in the MLS-assay. The OD600 values of each culture at the beginning were the following: SCD 0.5, SCX 1.5 and SCEG 1.0. After 7 hours, the cells were lysed as described above except the extraction buffer 25 mM Hepes (Sigma-Aldrich, Germany), 1 mM DTT, 100 mM KCl and 1x EDTA free protease inhibitor (Roche, USA) was used. Isocitrate lyase activities were measured by following the protocol described by Jean Marie Francois’ lab  where the two step reaction is monitored at 324 nm. DL-isocitric acid trisodium salt (Sigma-Aldrich, Germany), phenylhydrazine (Sigma-Aldrich, Germany) and buffer (100 mM imidazole (Sigma-Aldrich, Germany), 200 mM KCl, 2 mM EDTA (Sigma-Aldrich, Germany), 10 mM MgSO4) were used in the assay. The changes in absorbance were detected for 10 minutes from the beginning of each reaction by using the Varioskan (Thermo Scientific, USA) spectrophotometer. Three replicates were analysed for each strain-medium combination. Cultivations for testing the glycolic acid production were done using a 50 ml volume in 250 ml flasks. The cultivations were started from overnight cultures grown in liquid SCD-URA. The initial OD600 was 2.0 ± 0.3 (corresponding to about 0.7 g l-1 of cell dry mass) and flasks were shaken with 250 rpm in 30°C. Synthetic complete (SC) media was used with different carbon sources. 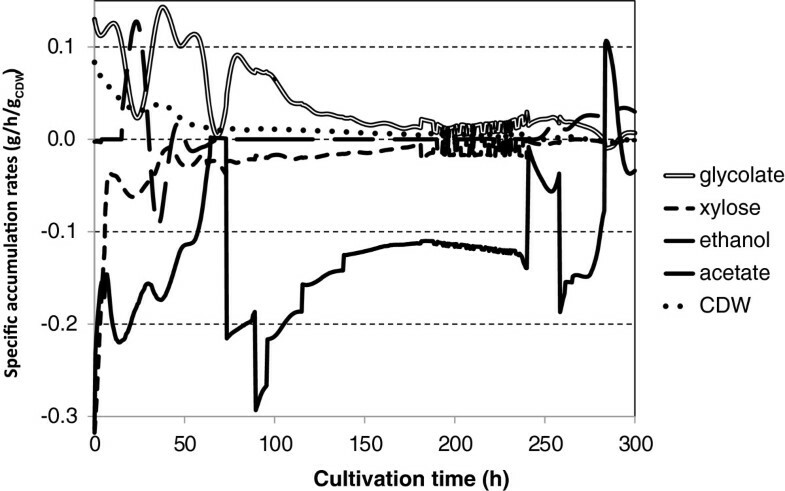 20 g l-1d-glucose (SCD), 20 g l-1 ethanol (SCE) and a mixture of 20 g l-1 ethanol and 20 g l-1d-xylose (SCEX) were used and three parallel cultivations of each strain and carbon source were done. 2 ml samples were taken daily and the OD600, pH and dry mass were measured. K. lactis strain H3986 was pregrown in shake flasks in modified synthetic complete (SC) medium lacking uracil . d-Glucose (20 g l-1) was provided as carbon source. Pregrown cells were used for yeast cultivation started at OD600 = 1 in a Biostat CT-DCU bioreactor (max. working volume 5000 ml, Sartorius, Göttingen, Germany) at pH 5.0, 30°C, 1 volume air [volume culture]-1 min-1 (vvm) and 500 rpm agitation with rushton turbines. The pH was maintained constant by addition of 2 M NaOH. Silicone antifoaming agent (BDH, 0.2 ml l-1) was added to prevent excess foaming. Batch medium was SC medium lacking uracil with 20 g l-1d-xylose and 15 g l-1 ethanol. d-Xylose and ethanol were fed to the bioreactor as separate feeds; 30% ethanol and 4% d-xylose feed. The d-xylose feed contained additionally SC medium lacking uracil. Bioreactor exhaust gas was measured using Innova 1313 Fermentation monitor and Innova 1309 Multipoint sampler (Innova Air Tech Instruments A/S, Ballerup, Denmark). Cell density was measured using Trucell in situ probe (Finesse, San Jose, CA, USA). d-Xylose, ethanol, acetate, glycolate, xylitol and glycerol were measured automatically every 30 minutes using on-line HPLC (Online HPLC Oy, Helsinki, Finland) . The column used in the on-line HPLC analysis was Transgenomic IC-SEP at 55°C with 5 mM H2SO4 (Merck KgaA, Germany) as an eluent at flow rate of 0.8 ml min-1. Dry cell masses were determined by washing the remaining pellet after centrifugation and drying it at +100°C overnight. Tubes were weighed with a Mettler Toledo analytical balance (Mettler Toledo, USA). The culture supernatant samples were analysed with Waters Alliance 2690 HPLC system (Waters, Milford, USA) where the injection volume was 20 μl. An Aminex HPX-87H Organic Acid Column (300 mm × 7.8 mm) (Bio-Rad, USA) linked to a Fast Acid Analysis Column (100 mm × 7.8 mm) (Bio-Rad, USA) was used as a stationary phase in the HPLC. Columns were maintained at +55°C and 2.5 mM H2SO4 (Merck KgaA, Germany) was used as an eluent with the flow rate of 0.5 ml min-1. Waters 2487 dual wavelength UV (210 nm) detector (Waters, Milford, USA) and Waters 410 differential refractometer (Waters, Milford, USA) were used for the detection of glycolic acid, d-xylose, ethanol, acetate and glycerol. Furthermore, the analysis of glycolic, malic and glyoxylic acids were also performed with P/ACE MDQ capillary electrophoresis system (Beckmann Coulter Inc., Fullerton, CA, USA) using UV detection according to Turkia et. al. . In short, background electrolyte solution was prepared from 20 mM 2,3-pyridinedicarboxylic acid, 0.3 mM myristyltrimethylammonium hydroxide, 30 mg l-1 Ca2+ and 30 mg l-1 Mg2+ in methanol:water (10:90, v/v). The pH of the solution was adjusted to 9.0 with ammonia. Untreated fused silica capillaries with inner diameter of 50 μm and total length 80 cm (70 cm to the detector) were used. Samples were injected by using 0.5 psi pressure for 15 s. Separation was carried out at −20 kV (reversed polarity) at constant capillary temperature 25°C. Indirect UV detection was set at 254 nm. All measurement data was smoothed appropriately and interpolated to a common time vector. Smoothing method of choice was a cubic spline smoothing algorithm in Matlab (The MathWorks, version R2010a) with smoothing parameters adapted for the respective measurement series. In order to calculate the real production and consumption rates r_c(t) cleared of dilution effects from the feed, the equation dc(t)/dt = r _ c(t) + Feed(t)/vol(t)(c _ f–c(t)), describing the apparent concentration changes dc/dt in a fed-batch cultivation, was used. The parameter c(t) describes the measured concentrations of metabolites and biomass, respectively; dc/dt are the apparent changes in concentrations and are calculated by computational derivation of the smoothed and interpolated measurement concentrations; Feed(t) denotes the feed with the concentration c_f of the fed substrate and vol(t) the momentary volume of the culture. The equation was rearranged to solve for the rates r _ c(t) = dc(t)/dt ‒ Feed(t)/vol(t)(c _ f–c(t)). The total feed Feed(t) consists of d-xylose feed, ethanol feed as well as base and acid addition by the pH controller. Therefore, in order to calculate the correct concentration of a certain compound in the feed, the equation c _ f = c _ fc Feed _ c t / Feed t was used, with c_fc the concentration in the particular feed Feed_c(t) and Feed(t) the momentary sum of all feeds. Since the online HPLC used a filter to recirculate the biomass from the samples taken, the biomass was both diluted by the feed and concentrated by the filter. This was taken into account by an additional negative feed in the biomass equation, equal to the volume loss by online HPLC sampling, with the feed biomass concentration equal to 0. Specific rates were then calculated by dividing the rates r_c(t) by the smoothed biomass measurements. Computational integration of the consumption or production rates, respectively, gave the accumulated amounts used or produced by the biomass during the fermentation, normalized to 1 liter. The accumulated amounts at the end of the cultivation were used for yield calculations. This work was financially supported by Forestcluster Ltd. Future Biorefinery (FuBio) programme and the Academy of Finland and is part of the research programme “White Biotechnology - Green Chemistry”, The Finnish Centre of Excellence Programme, 2008–2013, Project No. 118573. Work of Toni Paasikallio is gratefully acknowledged in performing the bioreactor cultivation and in setting up the on-line HPLC –based feed control. Dr. Paula Jouhten is acknowledged for the calculations of theoretical yields. We thank Dr. Andrew Conley for critical reading of the manuscript. Authors OMK, JK, PR and MP have a patent application on glycolic acid production in eukaryotic microbes. OMK carried out the Bioscreen experiments of the study and analysed the data. JK and OMK carried out the design and construction of S. cerevisiae strains. PR and OMK designed and constructed the K. lactis strains. OMK carried out the flask cultivations of the S. cerevisiae and K. lactis strains and analysed the data. JPP participated in designing the bioreactor cultivations. JPP and DB developed the on-line HPLC based measurement and control system of the feeds in bioreactor cultivations. DB analysed the data of the online-HPLC samples and did the rate calculations and HT preformed the CE studies and analysed the data. OMK, PR and JPP drafted the manuscript. PR and MP participated in the design and coordination of the study. All authors read and approved the final manuscript.